Usually I don’t like multichrome polishes on my nails (except multichrome flakies, but that’s a whole other story). They just don’t look good on me and there are several reasons for that. Oh yes, I’ve analyzed the frustrating matter in depth. First of all, when you look at my nails from the side, they don’t have a C-curve. They just grow straight and we all know that multichromes benefit greatly from a strong C-curve. Secondly, occasionally my nails grow a little asymmetrical and let me tell you, THIS is the perfect playing ground for multichromes. All of the sudden, every weird curve (not the non-existing C-curve of course …) is highlighted. And thirdly, the color shift in some multichromes gives me lobster hands. Lovely, isn’t it? 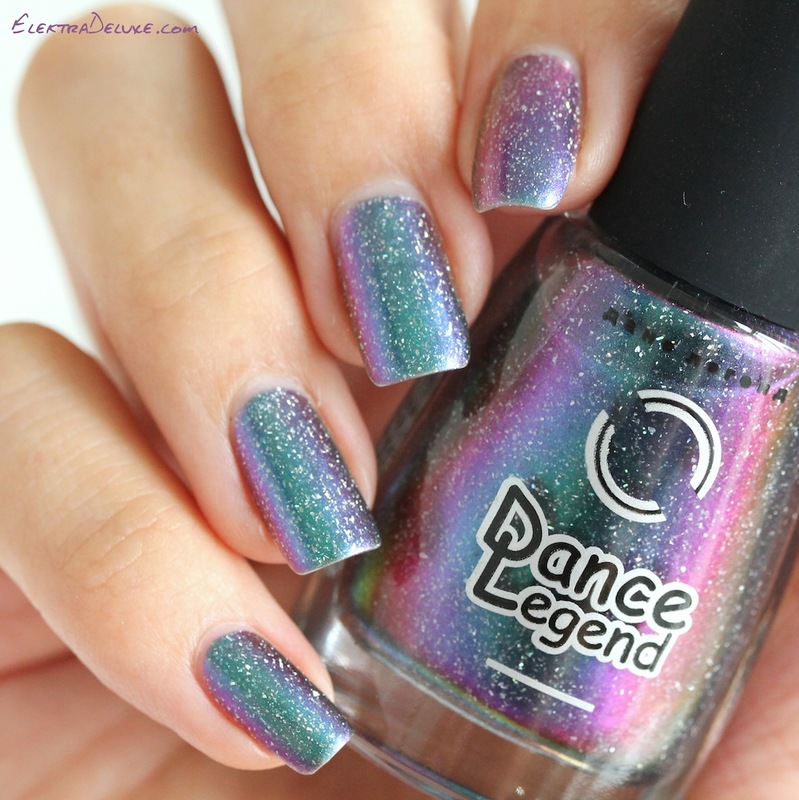 However, I found a multichrome that manages to overcome all the before mentioned obstacles: Dance Legend Milky Way! This particular shade doesn’t make my hands appear red, the color shift is strong enough that it doesn’t get lost on my straight nails and the large scattered holo particles distract from any weird curves. I consider this a personal victory. Dance Legend Milky Way shifts from an aqua/teal to purple to pink and orange. It is very sheer and it took me 3 coats to get it opaque. 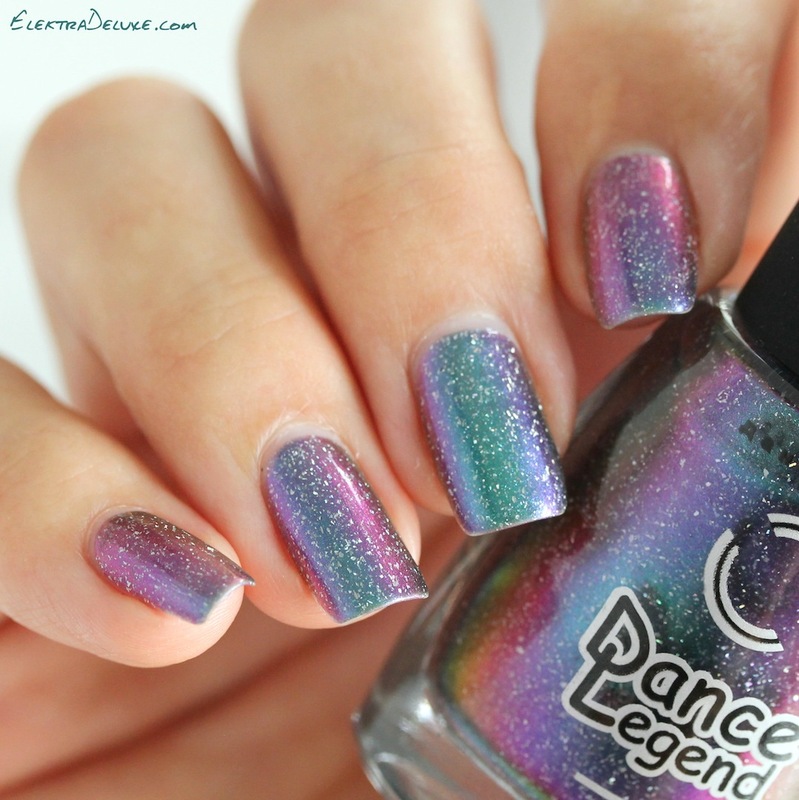 The polish belongs to the Dance Legend Galaxy Collection. I’ve already shown you two polishes from this collection in previous posts: Comet Tail and Solar Eclipse.